18 The PCB Magazine • September 2017 people." I was walking through this place with bubbling tanks and just about every manufacturing process seemingly known to man. 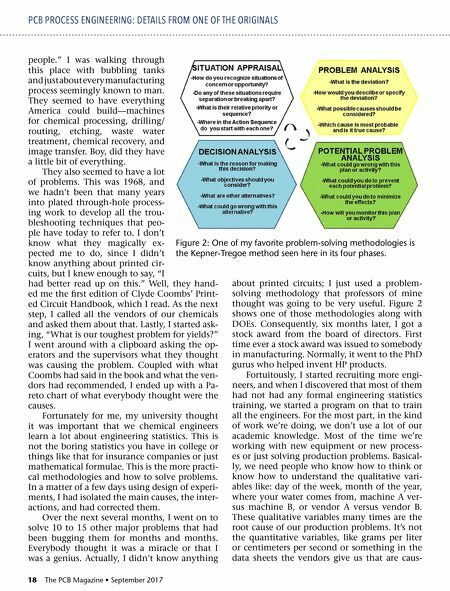 They seemed to have everything America could build—machines for chemical processing, drilling/ routing, etching, waste water treatment, chemical recovery, and image transfer. Boy, did they have a little bit of everything. They also seemed to have a lot of problems. This was 1968, and we hadn't been that many years into plated through-hole process- ing work to develop all the trou- bleshooting techniques that peo- ple have today to refer to. I don't know what they magically ex- pected me to do, since I didn't know anything about printed cir- cuits, but I knew enough to say, "I had better read up on this." Well, they hand- ed me the first edition of Clyde Coombs' Print- ed Circuit Handbook, which I read. As the next step, I called all the vendors of our chemicals and asked them about that. Lastly, I started ask- ing, "What is our toughest problem for yields?" I went around with a clipboard asking the op- erators and the supervisors what they thought was causing the problem. Coupled with what Coombs had said in the book and what the ven- dors had recommended, I ended up with a Pa- reto chart of what everybody thought were the causes. 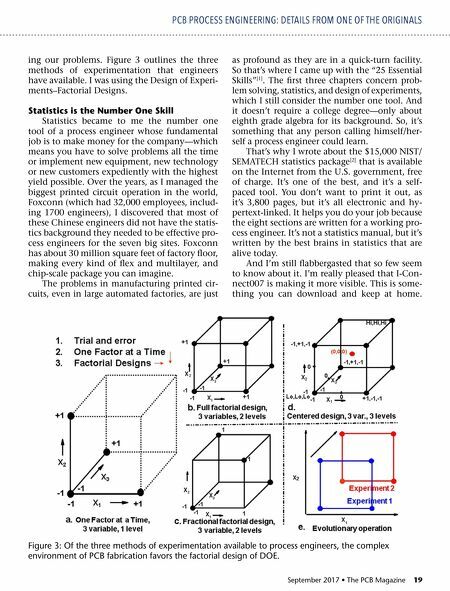 Fortunately for me, my university thought it was important that we chemical engineers learn a lot about engineering statistics. This is not the boring statistics you have in college or things like that for insurance companies or just mathematical formulae. This is the more practi- cal methodologies and how to solve problems. In a matter of a few days using design of experi- ments, I had isolated the main causes, the inter- actions, and had corrected them. Over the next several months, I went on to solve 10 to 15 other major problems that had been bugging them for months and months. Everybody thought it was a miracle or that I was a genius. Actually, I didn't know anything about printed circuits; I just used a problem- solving methodology that professors of mine thought was going to be very useful. Figure 2 shows one of those methodologies along with DOEs. Consequently, six months later, I got a stock award from the board of directors. First time ever a stock award was issued to somebody in manufacturing. Normally, it went to the PhD gurus who helped invent HP products. Fortuitously, I started recruiting more engi- neers, and when I discovered that most of them had not had any formal engineering statistics training, we started a program on that to train all the engineers. For the most part, in the kind of work we're doing, we don't use a lot of our academic knowledge. Most of the time we're working with new equipment or new process- es or just solving production problems. Basical- ly, we need people who know how to think or know how to understand the qualitative vari- ables like: day of the week, month of the year, where your water comes from, machine A ver- sus machine B, or vendor A versus vendor B. These qualitative variables many times are the root cause of our production problems. It's not the quantitative variables, like grams per liter or centimeters per second or something in the data sheets the vendors give us that are caus- PCB PROCESS ENGINEERING: DETAILS FROM ONE OF THE ORIGINALS Figure 2: One of my favorite problem-solving methodologies is the Kepner-Tregoe method seen here in its four phases.